I don’t understand how parsnips haven’t gotten their moment of trendiness and hype in the food world. I mean, if brussels sprouts has already had its moment, why not parsnips? 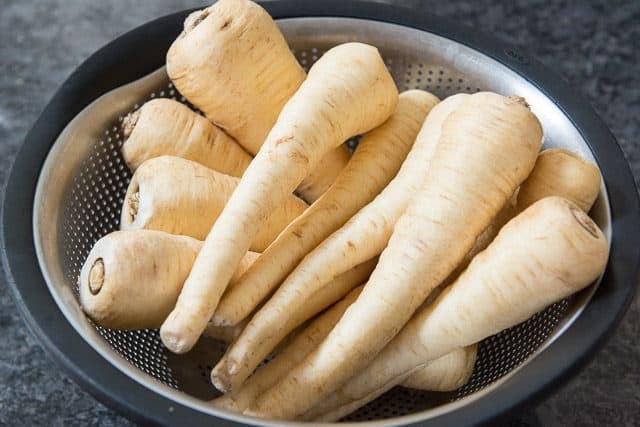 Parsnips are one of the most underrated vegetables and one of my favorites. They’re SO good. Even my toddler devours parsnips. That’s saying something. Today I’m sharing what I think is the best way to prepare them: roasted in a hot oven until they’re golden brown, caramelized, sweet, and tender, all while intensifying the natural (and unique!) flavor of parsnips. Parsnips are a root vegetable in the carrot family. They look like fatter, white carrots. Some people describe the taste of parsnips as like a spicy carrot, but I don’t view them this way. Parsnips are sweeter than carrots, with a nutty and earthy flavor. 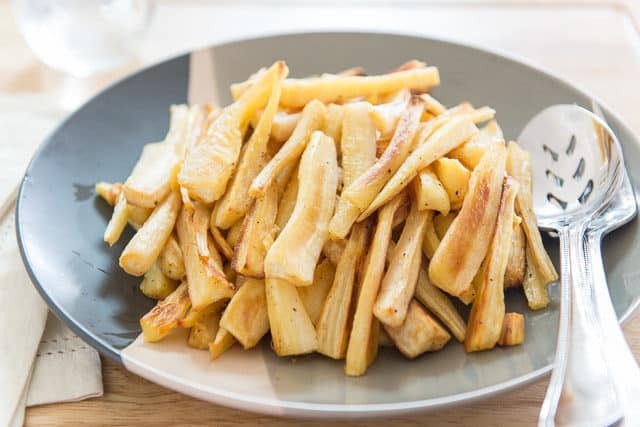 I also wouldn’t describe parsnips as spicy, but rather as “spiced.” As if the vegetable had been seasoned with a combination of warm spices like cinnamon, clove, nutmeg, etc. The flavor is SO delicious. Smaller parsnips tend to be better for a few reasons. The bigger the parsnip, the tougher the outer skin gets. The parsnips below definitely have to be peeled. Sometimes the smaller, younger parsnips you can get away with not peeling. The bigger the parsnip, the more fibrous and larger the inner core is. The really huge ones, you may have to cut the inner core out for a more pleasant eating experience. Smaller parsnips often have a better texture. Smaller parsnips also tend to have better flavor. This is true of a lot of vegetables. So if you can help it, try to pick smaller parsnips. My store sells them pre-packaged in bags, so I usually don’t have much choice, but I look among the bags and try to select smaller ones from there. 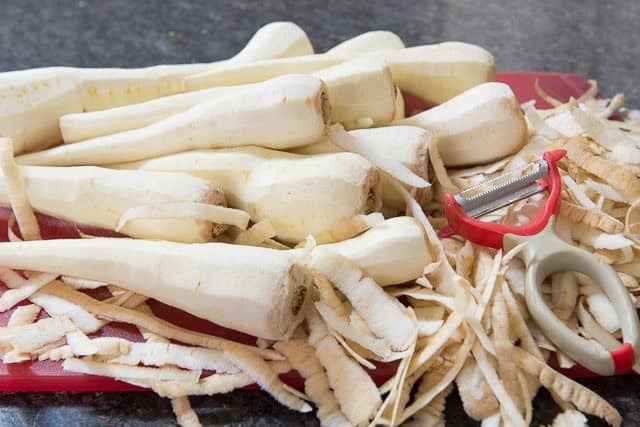 Do you have to peel parsnips? The big ones, yes. The skin is usually fairly tough and woody. If you have some smaller, younger parsnips, you may be able to leave the skin on. Parsnips look annoying to cut into even pieces because the size usually varies hugely from top to bottom, but it’s actually pretty easy. I like to cut the parsnips into matchsticks. Cut each parsnip in half at the middle, to split the larger diameter top part from the thinner bottom part. Then you can cut the bottom smaller part in half, and the larger tops into thirds or quarters so everything is about the same size and cooks evenly. 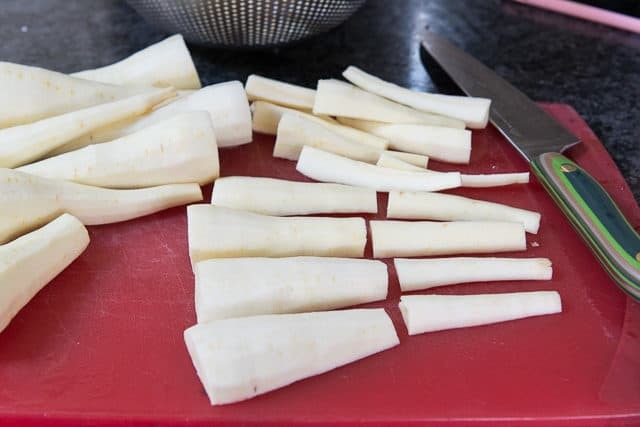 You can also cut parsnips into coins, but toward the larger tops of the parsnip, you’ll have to cut them into half-moons or even quarters because it’s so much bigger than the thin bottoms of the parsnip. They should ideally have a little bit of room in the sides so the steam can escape while cooking and the parsnips can brown. Roasted Cauliflower is another one of my favorite simple veggie sides. 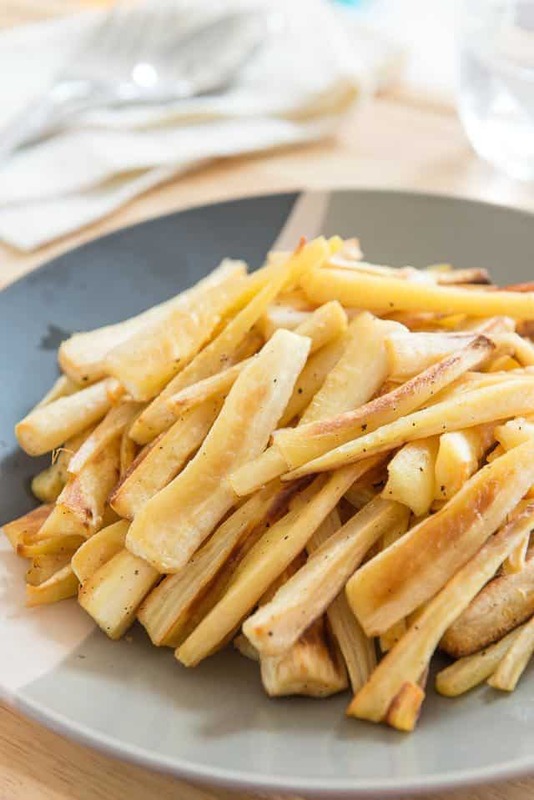 Like these parsnips, they are naturally paleo, gluten free, whole30, and suited to toddler eating too. Enjoy! 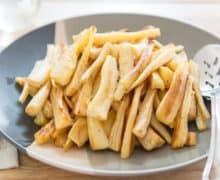 Can roasted parsnips be frozen? Yes, since they’ve already been cooked, they freeze well for up to 1 month. How to store roasted parsnips: These will keep well in the fridge for 3 days. Just microwave them to reheat, or heat them up in the oven. Can you roast parsnips in advance? Yes, these re-heat well. Toss in another tbsp of olive oil, then heat in a dish in a 350F oven for about 10 minutes, or until warmed through. 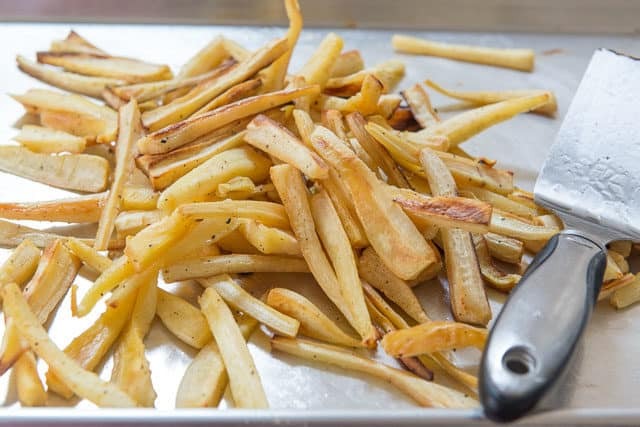 What other flavors can you add to roasted parsnips? For a sweeter flavor, add 1-2 tbsp of maple syrup, and ground spices like cinnamon, nutmeg, cloves, ginger, and allspice. You can get more flavor ideas from The Flavor Bible, one of my favorite books! 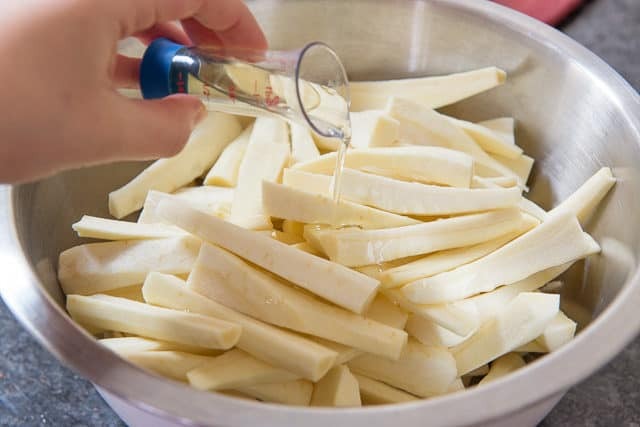 Peel the parsnips, then cut into evenly sized matchsticks. Place in a large bowl and toss with the olive oil, salt, and pepper. 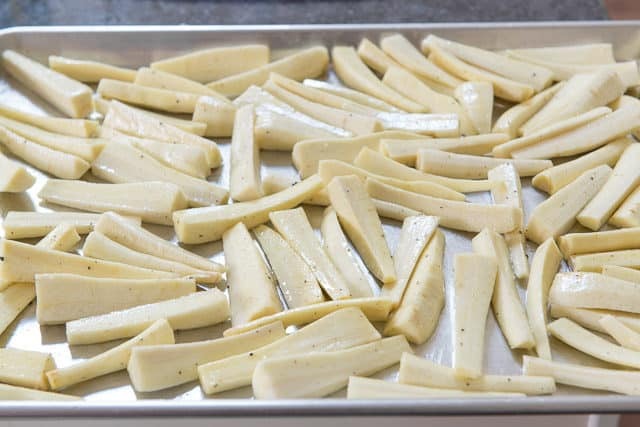 Evenly distribute the parsnips on a baking sheet in a single layer, making sure they have a little room on the sides to brown and caramelize. Roast for about 20-25 minutes, until the parsnips are starting to turn golden brown on the edges. Toss the parsnips to redistribute, then roast for another 10-15 minutes, until tender and golden. Note on cooking times: The exact time varies depending on how big the matchsticks are, so make sure to check on them once in a while to see if they've become caramelized and fork tender. That's when you know they're done. I love that they naturally caramelize!